BelarusDigest > All > Is Radical Islam a Threat for Belarus? Is Radical Islam a Threat for Belarus? On 11 January, the Committee for State Security (KGB) made public information about the arrest of 20 Muslim Salafis that took place near Minsk in late November 2014. While Belarus' security services have monitored the behaviour of Islamic radicals in the past, the arrest is one of the most important actions taken by the authorities against Muslim extremists. Muslims have lived in Belarus since the 14th century, blending in well. However, in recent years preachers from other states have been changing the nature of Islam in Belarus by infusing radical ideas. By arresting a group of Salafi Muslims, Belarus may be signalling to the West that it is a reliable partner in fighting terrorism. How could Minsk benefit from such efforts? More than 30,000 Muslims live in Belarus today, amounting to 0.5% of the total population. Muslim Tatars first arrived to Belarus as mercenary fighters in the 14th century at the invitation of the Grand Duchy of Lithuania. The Tatar community even created its own writing system for the Belarusian language, using Arabic script. Muslims have few mosques in Belarus, as the Communists ruined many of them, including one located in the centre of Minsk. Now a new Sunni mosque is being built in the the capital of Belarus. Construction of the new mosque is financed not only by Belarusian Muslims, but also by people and organisations from Saudi Arabia, Turkey and Russia. Today around 10 mosques and prayer houses operate in 25 Belarusian communities. Their number is similar to the number of prayer houses and churches of Jehovah's Witnesses or Lutherans. Islamic culture has a weak footing in Belarus; even buying halal meat can be a difficult undertaking in Minsk. Islam in Belarus has its own geography. The Muslims recently detained near Minsk, or 'Islamicists' as Belarusian authorities have deemed them, planned to preach in the Minsk, Hrodna and Mahiliou regions – in northern Belarus. In the southern regions of Belarus not a single mosque is open. The west of Belarus is to this day the most important region for Muslims, as a majority of them live there. The reason for this is rather simple – the Grand Duke of Lithuania Vitaut settled the Tatars around Vilnius. Migrants from Arab countries who are working or studying in Belarus can affect local Muslims. Insiders say that influence from Arab countries, Turkey and Tatarstan remain a serious problem as they bring with them more radical Muslim views. Siahei Bohdan from the Ostrogorski Centre told Belarus Digest that Belarusian Muslims think that Muslims from these countries are more religious than they are. And this is precisely the reason why they may follow such radical ideas that emanate from outside the country. The topic of radical Islam has until now not attracted much attention. But four days after the terrorist attacks in Paris, on 11 January, the press-secretary of the KGB announced the arrest of 20 Muslim Salafis. The authorities deported eight Muslims as foreign nationals. Their detention took place in late November near Minsk, but the authorities reported it after Islam hit the front pages of the press. The individuals detained were all inspired by the ideas of the Hizb ut-Tahrir organisation, which is banned in Russia and Germany, but operates openly in the United States and Ukraine. Its members adhere to a more moderate version of radical Islam – they support the terrorists’ goals, but not their methods. The group planned to preach among Belarusian Muslims, but as the spokesman for the KGB explained, “the authorities have applied preventive measures before the 'Islamicists' could commit a crime”. Muslims in Belarus are under tight governmental control. According to Belarusian Muslim Rustam Hasenevich who spoke with the TUT.by web-site the Belarusian authorities had deported some years ago several preachers of radical Islam, most of whom had reportedly come to Belarus from Arab countries. According to him, “the intelligence agencies control everything that is going on among Muslims. On Friday they know what happens at prayer, and who spoke with whom”. It is rumoured that the KGB has a special department that deals with Islam. According to Siarhei Bohdan some Belarusians have links to world reknowned terrorist organisations. For example, in 2005 the Spanish police arrested a Belarusian, Andrei Misyura, a chemical weapons expert for Al Qaeda, who studied chemistry at Belarusian State University. Belarus has even suffered a terrorist attack which the police initially associated with radical Islam. In 2012, the police arrested a man in a mask with an inscription in Arabic who had attempted to blow up a police station in Zhlobin, a town in eastern Belarus. Law enforcement officials stated that the detainee had relations with a group involved in moving Afghan citizens to the countries of Western Europe. But the court found the detainee mentally ill and sent him for treatment instead of imposing a jail sentence. How Dangerous is Radical Islam in Belarus? Now and then there a group of individuals turns up among Belarusian Muslims who strive for a purer, as they would have it, type of Islam. It is no difficult task to find Belarusian Wahhabis (a radical conservative Muslim confession) on vk.com, a popular social network. This does not mean that these Muslims are automatically associated with terrorism, but there is a chance that they can pose a threat to society. Belarusian Muslims are unlikely to carry out terrorist attacks in Belarus. In 2006, when the Zhoda newspaper reprinted cartoons of the Prophet Muhammad, the authorities closed the newspaper and the editor spent three months in prison. However, radical Muslims in Belarus can easily become propagandists of terrorism through social networks or create a community that can contribute to terrorism. Belarus can itself become a transit point for radical Muslims headed to the European Union. Even now Belarus, with a transparent border with Russia and borders with three Schengen area countries, can serve as a gateway for many individuals into the EU. Belarus has no public data on deportations, but it is believed that each year Belarus deports dozens of people from Afghanistan, Pakistan or the Northern Caucasus who try to enter the EU illegally. In 2014, the Lithuanian State Border Guard Service reported that it detained 11 Afghans who crossed the border illegally from Belarus. It seems that the Belarusian authorities will be happy to use the topic of radical Islam in their favour. The fact that the information about the detention of 20 Salafists appeared after the attack on Charles Hebdo proves precisely this point. Belarus will display its unified interests with the West and its efforts in confronting radical Islam. Belarus may also try to get funding for the West to fight terrorism. And it will be hard for the West to refuse such appeals. Currently radical Islam lacks a substantial footing in Belarus. But it can arrive with preachers from other states, who import not only money for the construction of mosques, but also radical views. Belarusians are really beginning to worry about their domestic state of economic affairs more than Ukraine as of late. This is the main result of a December 2014 poll from the Independent Institute of Socio-Economic and Political Studies (IISEPS) published in early January. The number of people favouring a pro-European orientation for the country and supporting Ukraine in its conflict with Russia has increased after almost a year of falling. The same was the case with the approval rating of Alexander Lukashenka: it fell after nine months of growing. The tough economic situation in Belarus that followed the economic crisis in Russia partially explains these developments. A relative calm in fighting in Ukraine also contributed to this shift in public opinion. However, the public's dissatisfaction, leading up to the 2015-presidential campaign, will hardly shake the foundations of the political regime. And yet, Alexander Lukashenka's nerves in the wake of the elections and his potential clumsy measures to manually fix the economy may destabilise the situation even further. The first set of the December IISEPS poll results, indicating this important shift in Belarusian public opinion, included views on foreign policy and the Ukrainian crisis. Following the annexation of Crimea, the beginning of the war in Eastern Ukraine and a new wave of pro-Kremlin propaganda, between 55% to 70% of Belarusians (depending on the question) have supported the official Russian stance on the Ukrainian crisis. Moreover, in March, July and September 2014 IISEPS polls showed a serious decline in pro-European sentiments among Belarusians. Society was disappointed by the West's policy towards Ukraine as they saw it from how Russian media portrayed it. Two thirds claimed their attitude to the European Union worsened during 2014. December was the first month in a year when the popularity of the "pro-Russian replies" such as the justness of Crimea's annexation, support for Russian-backed separatists, a desire to unite with Russia, and a refusal to join the EU if it were proposed all went down by 3-6% on average. Accordingly, support for Ukrainian territorial integrity, viewing the Crimean events as an illegal annexation, a preference for European integration over a union with Russia – went up by the same 3-6% margin. Belarusians holding these views still constitute a minority, but now it is a growing one. Several factors explain this new trend. First of all, Belarusians have recovered from the psycho-informational shock after a war burst out in their neighbourhood. People have become more rational in analysing the events in Ukraine. The truce in Eastern Ukraine and, hence, the less aggressive TV coverage of the conflict also contributed to this "cooling off" in society. The economic crisis in Russia, especially when it started to spread to the Belarusian economy, has also made some Belarusians reconsider their geopolitical views. It is one thing to support Russia's swift and "cordial" takeover of Crimea, and another thing altogether to pay the price for aggression committed by your neighbour. After Vladimir's Putin soaring approval rate started to go down in Russia from 87% some joked that, at long last, the refrigerator has started to win the battle against the TV-set in Russian minds. In other words, Russians have begun to value their well-being and shrinking incomes more than abstract geopolitical achievements promoted by TV propaganda. The December IISEPS poll revealed the same trend in Belarus in relation to Lukashenka's rating. On the graph above are Lukashenka's first climbs in popularity from around 20% as the country recovered from the devastating financial crisis of 2011. It rises to 42.7% in September of 2013. Then the GDP and salaries stop growing and his support level starts to decline once more, but then suddenly – a sharp climb upwards back to 45% unfolds, despite the fact that incomes have not increased. Sociologists from IISEPS explained this anomaly as a result of the Ukrainian factor. Namely, Belarusians compared their own lives with those of Ukrainians and started to value stability and peace more than economic prosperity and, naturally, supported the head of state who has managed to protect them from these and other unpleasantries. However, seeing as Ukraine has fallen out of many people daily concerns, their concern for their own economic well-being has taken over. In other words, Lukashenka has exhausted his ability to gain popularity from the Ukrainian conflict. 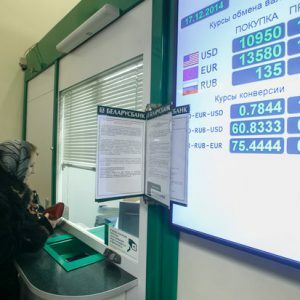 It is important to note that IISEPS carried out its poll in the beginning of December – before panic on the Belarusian currency market and nearly a 40% devaluation of the Belarusian currency took place. This means that by now, the middle of January 2015, Lukashenka's ratings have almost certainly dropped even lower. A country arrives at election year in a state of socio-economic turbulence. Intrigue returns to the presidential election. Welcome instability! However, the foreseeable public disappointment in the economy has few chances of leading to a serious political or protest movement. First of all, to challenge the authoritarian regime one needs a viable political alternative to it. The Belarusian opposition that is showing for the 2015 elections probably in the worst shape it has ever been. According to IISEPS data, the public's trust towards all oppositional parties combined remains stable, but low – 16%. The most popular opposition leaders enjoy only 2-3.5% electoral support. The political unification talks among seven of the most viable opposition organisations failed in November 2014. Figures who are considering making a run at the presidency in 2015 (Anatol Liabedzka, Uladzimir Niakliaeu and others) have found themselves in a very difficult conceptual gridlock. Having no resources to obtain free and fair elections they have to count on street protests as a last resort. But Belarusian society has taken a strong anti-revolution vaccine as a result of the Ukrainian revolution and how it was reflected in both Russian and Belarusian state-controlled media. The economic crisis that Belarus has been undergoing since December 2014 has become an additional obstacle for Lukashenka's opponents, though it might sound illogical at first glance. With limited possibilities of getting substantial Russian economic support, the Belarusian authorities are expected to bet not on political carrots (raising salaries in an election year) as is their custom, but on sticks – more repression and preventive actions to deter possible protests. The atmosphere of the 2015 presidential elections will most likely differ from that of 2010, when nine alternative candidates could freely campaign, meet with the voters and debate in a live show on state TV. In December, Belarus' parliament swiftly adopted amendments to the laws on media that complicate the work of online media. A recent wave of blocking independent web sites was another sign of this tightening-the-screws trend. Still, it appears to be too early to bury all intrigue. Psychologically, coming to the elections without traditional big bag of bailout cash, is an issue of much concern for Alexander Lukashenka. Faced these new conditions, he may resort to some radical economic measures to bring everything back under control. This may well have its own unpredictable political ramifications.